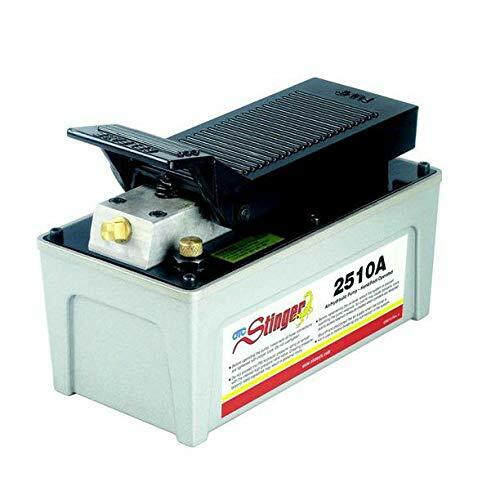 With shop air as the energy source, OTC's 2510A 'Stinger' Air/Hydraulic pump has the power and oil capacity (98 cubic inches of useable oil) to drive even the large 55-ton rams. With high capacity, quality materials, and robust construction, this unit is an ideal all-around power source for dozens of body, frame, and alignment applications. It can be used with a variety of rams, presses, and hydraulic pullers operating at up to 10,000 PSI. An internal relief valve protects the hydraulic components regardless of hydraulic pressure. In addition, a two-stage release mechanism gives fast or metered ram return while reducing hydraulic shock. Pump requires 9 cfm at 100 PSI air pressure (at the pump). Value is at the core of the OTC tool and equipment portfolio. For a simple repair or the most complex drivability concern, these award-winning tools universally solve problems faster, and at better value, than any other product line available. Whether it’s a specialty tool or unique piece of service equipment, OTC provides top solutions to modern automotive service challenges while increasing technician productivity and shop profits.